Like London and its seemingly infinite number of pubs, Rome is chalk full of gelaterias. Countless really. 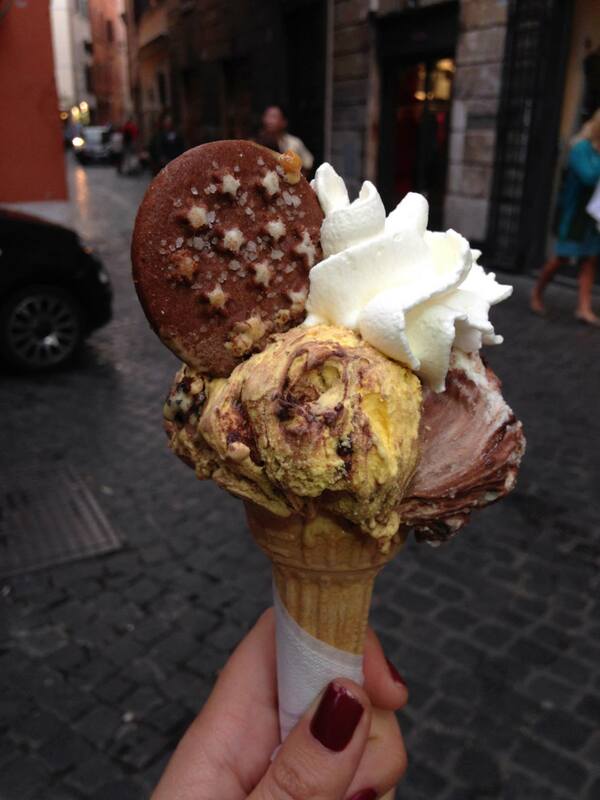 And I’m sure there are at least 50 establishments people claim as the best gelateria in Rome. I won’t pretend to know, with certainty, the absolute best gelateria in Rome, but the following two are ones I always return to. The first is Gelateria la Romana. With a fresh farmhouse vibe and plenty of seating, this one is my new favourite. It’s also conveniently near the Termini, which is where I usually stay so I can make quick exits (as my visits to Rome these days are usually less than two days). This place is properly gourmet. They even have different flavoured whipped cream. And the whipped cream is divine. I could have just a scoop of that on a cone. This last time I had the coffee whipped cream. Oh my. Wherever you are staying in the city, this one is worth a little journey. The second is Frigidarium. Frigidarium is convenient for me because it’s a two minute walk from my favourite restaurant in Rome, Cul de Sac. Frigidarium’s location is nothing fancy and doesn’t afford its patrons any seating other than one bench outside. So it’s the grab and go sort. My favourite flavour is their “Frigidarium” flavour. To be honest, I’m not sure exactly what it is, but it has crunchy biscuit bits and I’m all about it. After a healthy scoop of that atop a cone, I have them add a biscuit and dunk the whole thing in dark chocolate. I won’t lie, trying to eat this massive scoop covered in a crispy dark chocolate coating is no delicate matter. It get’s messy, though it is a little easier if you get it in a cup.